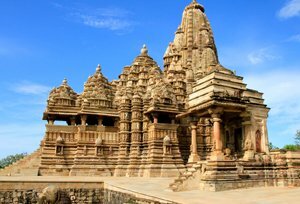 Our 2 nights and 3 days Khajuraho Honeymoon Tour will give you a chance to explore the architectural beauty of the place while spending quality time with your partner. We understand the shortage of time because of busy professional life. Considering this, our Khajuraho Honeymoon Tour is ideal for all those who are facing lack of time issue and don’t want to compromise on the better start of their life. Sound & Light Show: The Light and Sound show on the Western Group of temples complex the reminds the life and times of the great Chandela Kings and mark out the story of the exclusive temples from the 10th Century to the present day. The 50-minute fascinating show is held in every evening and it runs in Hindi and in English. After breakfast visit for western group of temple and eastern group of temple. Afternoon free for self activities. Overnight stay at hotel.